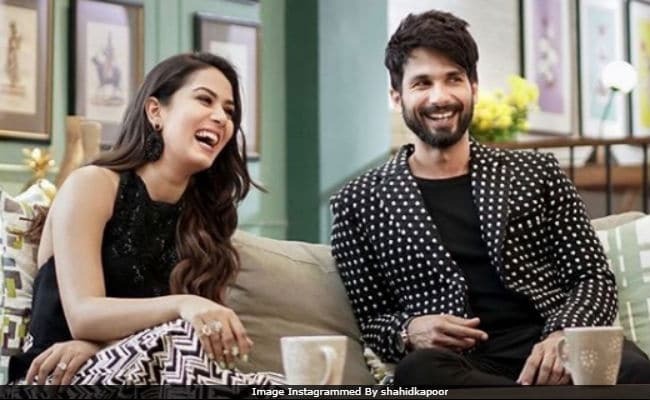 Star couple Shahid Kapoor and Mira Rajput will be seen in the best no-filter version of themselves this Saturday on Neha Dhupia's chat show BFFs With Vogue. A video clip of Shahid and Mira, answering some bomb questions, has gained the top trends on the Internet today. "Has anyone cheated on you and who?" Shahid was asked. (His reply - more on that bit later). The video clip, shared on the channel's Twitter page, starts with Mira, who is asked to name a famous person who is a bore at parties. Mira instantly answers - Shahid. "Just kidding," she says, after Shahid gives her those looks. Neha: Has anyone cheated on you and who? Mira interrupts and says, "Let's just rephrase and say how many?" Shahid's answer - "Sure about one, have major doubts about another one." Shahid Kapoor dated Kareena Kapoor for about four years (2003-2007). They reportedly broke-up while Kareena was shooting for 2008's Tashan with Saif Ali Khan. Later, Shahid was rumoured to be dating his co-stars Vidya Balan and Priyanka Chopra. Shahid and Kareena co-starred in films like Fida and Jab We Met. Kareena is now married to actor Saif Ali Khan and they are parents to a son Taimur, 1. Shahid Kapoor married Mira Rajput in an extremely private ceremony in 2015. Their daughter Misha was born in August 2016. Shahid and Mira will appear in the grand finale of BFFs With Vogue, which airs this Saturday. They had made their debut appearance as a couple on Karan Johar's chat show Koffee With Karan 5.